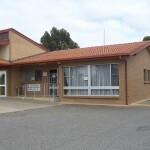 The Mallee Medical Practice at Karoonda is a modern surgery, purpose built in 1989 and joins onto the Karoonda hospital (Mallee Health Service). The practice is serviced by visiting doctors from the Mannum practice. Other services include: a nurse practitioner, physiotherapist, diabetes educators, audiologist, dieticians, mental health worker, chronic disease management nurse and podiatrists.